As television’s first home improvement series, This Old House began its broadcast in 1979 featuring expert home renovation for national audiences. 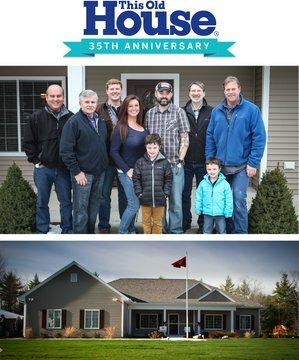 Thirty-five years later, the beloved cast of experts (general contractor Tom Silva, master carpenter Norm Abram, plumbing and heating expert Richard Trethewey, landscape contractor Roger Cook, and host Kevin O’Connor) bring viewers a special project — not an old house, but a brand new home for a wounded Iraq war veteran. The entire construction project was coordinated and overseen by the non-profit organization Homes for Our Troops. On his first deployment to Iraq in 2003, Matt DeWitt sustained serious injuries in an RPG attack that resulted in the partial amputation of both of his arms. Today, his family looks forward to their new home where keyless entry, raised countertops, accessible storage, touchless faucets and raised garden beds will make life easier as Matt and his wife, Cat, raise their two sons and pursue shared passions for cycling and gardening. This Old House also created a companion web series, Welcome Home From This Old House, featuring other Homes for Our Troops recipients who are introduced in the broadcasting episodes. The Veteran's Special House Project premiered Thursday, May 14, 2015. Check your local listings. Watch the program below.